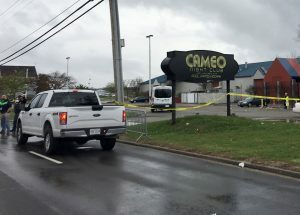 One person is dead and 14 were wounded after multiple people opened fire early Sunday morning during a dispute inside a packed Cincinnati nightclub, police said. Cincinnati Assistant Police Chief Paul Neudigate posted on Twitter that the incident was not related to terrorism. “Motive is still unclear but there are no indications this incident is terrorism related,” the post said. Police Chief Eliot Isaac said late Sunday morning that authorities continue to search for suspects. One witness told the Cincinnati Enquirer that there was a “big brawl” before the shootings. Cincinnati City Manager Harry Black said that the fight was between two groups or individuals. He also noted that the club itself “has a history of gun violence,” and that two shootings happened there in 2015. Of the 15 people who were shot, one was reported killed. Some of the wounded reportedly made their way to hospitals on their own, and at least one person was in critical condition.